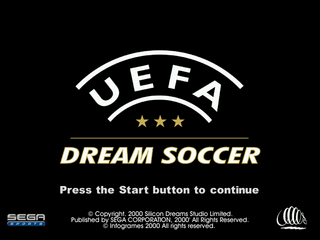 UEFA Dream Soccer is a football game for the Sega Dreamcast, released in October 2000. It was developed by Silicon Dreams and published by Sega under the Sega Sports brand, and was released exclusively in Europe. It is a sequel to Sega Worldwide Soccer 2000.
Notable additions over Sega Worldwide Soccer 2000 and Sega Worldwide Soccer 2000: Euro Edition include female players with different attributes to their male counterparts, and a revised animation system, which not only includes animation blending, but 200,000 frames of animation obtained through motion-capturing technologies. UEFA Dream Soccer originally started life off as Sega Worldwide Soccer 2001, being a sequel to Sega Worldwide Soccer 2000. An early demonstration of the game was featured in DreamOn Volume 14 showing motion-captured animations, some still screenshots and various work-in-progress assets. Worldwide Soccer 2001 was developed independently from Sega Worldwide Soccer 2000: Euro Edition was set for release in the last quarter of 2000 (later December). At some point Sega and Silicon Dreams partnered with Infogrames, presumably for the official UEFA licensing which Infogrames held at the time. The game hence became UEFA Dream Soccer, though aside from the new licensing, very little was changed (and Infogrames' input appears to have been minimal). UEFA Dream Soccer is completely unrelated to UEFA Striker, published by Infogrames for the Dreamcast (and other systems) in 1999. UEFA Dream Soccer would be Silicon Dreams' last collaboration with Sega. Main article: UEFA Dream Soccer/Magazine articles.